The foundation of a common language is customer focused messaging used by sales and marketing - Part 1. Tip 1 Where to start? Consider a frame work which allows all 3 areas of Sales and Marketing Alignment to naturally grow together. The foundation of the frame becomes messaging which allows customers to easily visualize how the capabilities of your products and services help them achieve their needs. It is not "About IT". It is about what "Buyers Can Achieve With IT". Tip 2: Our clients have demonstrated the best place to begin is to use a list of features associated with a common group of products or services and drill into these looking for those which help customers achieve their most compelling needs. Focusing on those features which address the most compelling needs, are unique, and deliver the most value. The best experience in this exercise is with a smaller cross functional team of sales, marketing and subject matter experts. Looking for the internal experts which understand in detail how the end customer uses the products and services in their business to satisfy their needs. It is also recommend to use different teams as required based on the variety and quantity of product or service groupings within a company. Tip 3: The objective is to craft Sales and Marketing Messaging which allow new and existing customers to visualize the business usage of the product or service. 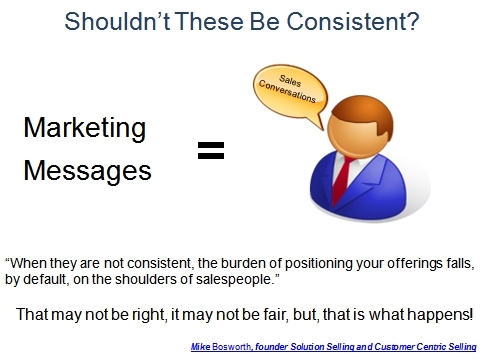 It is also important the messages resonate based on the title your sales people call on. An example is a CFO or the VP Sales will have different needs, thus they will require different messaging. To assist with message creation, what are the metrics the feature can address, this will help lead to the business usage and needs. Then think about the business usage and craft a message which allows a prospect to begin to see how the feature, (which is not listed in the message), will help them achieve their needs and impact the metrics. Tip 4: Combine the visual messages with consultative based selling skills to help prospects develop a Vision of a Solution, based on value, as to how the product or service usage will help them achieve their needs. Consultative selling skills are used to help the prospects discover needs during the discovery phase based on value. Also to assist the individual in forming a Vision of a Solution in their mind as to how the capabilities being discussed with help them achieve their needs.. Tip 5: Customer focused messages create a common language used in the buy-sell cycle with customers and also between Sales and Marketing. It is important to note these messages are not directed at "generic" individuals. Make sure to craft them for the individual titles of the decision makers your sales people need to access during the buy-sell cycle. Tip 6: Depending on the markets/industries covered, different variations of messages may certainly be required. An example is different standards are required by pharmacy and cosmetic companies. Both require purity in many areas, however, the standards, and the terms used to describe the level of purity changes. prospect relates them to their individual business needs in their company and the market place they compete in. Tip 7: Use the customer focused messages as building blocks in all of your sales and marketing tools. They can be used in all of the various demand generation, nurturing, prospecting and sales activities used throughout the buy-sell cycle. With a solid list of customer messaging crafted to allow the individual to visualize usage, we are ready for the next step. Lining up our sales methods with the shifting concerns of how individuals make buying decisions. Whether the buyer-customer is making the buying decision themselves, or in a Buying Committee, we are still selling to individuals with individual compelling business needs. using a common language and a common sales process. Part 1 focused on a common language. 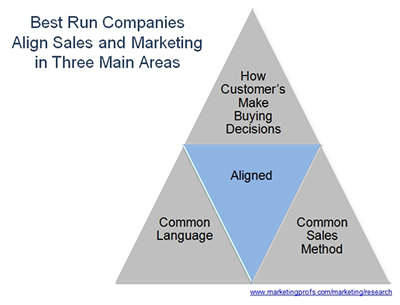 See part 2 on aligning sales and marketing around the customers buying process, how individuals make buying decisions. In part 3 we cover a common sales method.